Jeff Riggenbach, Ph.D., LPC, is one of the most sought after experts in North America in the area of CBT and personality disorders. He has developed CBT based mood disorder, anxiety disorder, and borderline personality disorder treatment programs at two different psychiatric hospitals. 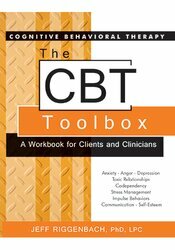 Dr. Riggenbach has also authored The CBT Toolbox: A Workbook for Clients and Clinicians. "Using many clear clinical examples, Riggenbach moves easily between theory, conceptualization, treatment planning, and the application of CBT techniques. It is well-written, user-friendly, and filled with the information and ideas that can only come from an expert clinician." "Clear, accessible and easy-to-read, this workbook presents each problem in terms of the characteristic thinking patterns, feelings and behaviors of the client. Effective and practical tools including reproducible forms and handouts are provided to facilitate healing. Whether you are familiar or new to CBT, this workbook is highly recommended." Founding Fellow of the Academy of Cognitive Therapy and author of "Heal Yourself: A CBT Approach to Reducing Therapist Distress and Increasing Therapeutic Effectiveness"